This year marks the 100th year of Boy Scouts of America and Hunter Henson will forever have a place in history when speaking of Troop 60. Hunter is the 36th Eagle Scout of Troop 60, which has also had prominent citizens such as mayor Jack Keith and John Sorrell as members of the troop who attained Eagle status. 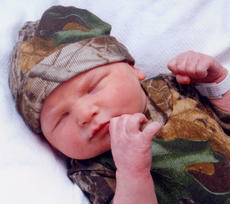 Landon Gunnar Thomas was born to Drew and Brittany Thomas of Falmouth, Ky. on Nov. 17, 2010 at St. Elizabeth North. He weighed 9 lbs. 1 oz., and is welcomed by his sister, Addison Jo. Maternal grandparents are Rick and Pam Yelton of Morgan, Ky.
Paternal grandparents are Jackie and Joy Thomas of Butler, Ky.
Great-grandparents are Jack and Pat Yelton, Cecil and Dottie Alsip and Brenda Thomas of Cynthiana and the late Jack Thomas. Hunter Raymond McElfresh was born to Robert and Kendra (Earlywine) McElfresh, formerly of Cynthiana, on Nov. 23, 2010 at Community East Hospital in Indianapolis, Ind. He weighed 6 lbs. 1 oz. He is welcomed by his sisters, Kayleigh May Thompson and Jaden Thomas Fryman. Maternal grandparents are Kimberly (Duke) Richardson and Jeffery Earlywine; maternal great-grandparents are Charles Raymond Thompson and Sandra Darlene Thompson. Paternal grandparents are Robin (Kiskaden) Joseph and Eric Joseph; paternal great-grandparents are the Late Bob and Della Kiskaden. Nicolette Nave’lay Feehan was born to Emily Morris and T. J. Feehan on Sept. 23, 2010 at Patty A. Clay Hospital in Richmond, Ky.
Maternal grandparents are Greg and Debbie Morris of Cynthiana; maternal great-grandmother is Wilma Hurt of Campton, Ky.
Paternal grandparents are Connie Carter of Cynthiana and the late Thomas J. Feehan of New Jersey. * Cynthiana Democrat, Dec. 20, 1934 -- “Rohs Theatre, Walnut Street, coming Wednesday and Thursday, Dec. 26 and 27, Special Pre-Release Showing Shirley Temple in ‘Bright Eyes’ - A Fox Picture with James Dunn. Also “Popeye, The Sailor Man.” (Movies are not showing at this Walnut Street location, but there is lots to see here. Open on Fridays and Saturdays, 10 a.m. to 5 p.m.). Births announced this week are: No births this issue. Actress Glenn Close visits the farm of the Bellis-Jones family. Close was interested in buying one of the Bellis-Jones’ riding horses for her daughter. Harrison County band will be featured on KET for the KMEA State Marching Band finals. * Thanks, thanks to our veterans. It is near impossible to express in words what we owe to these men and women. * Your local museum. The Cynthiana-Harrison County Museum, honors veterans. The military displays recognize those who have served throughout time and at present with pictures, flags, uniforms, memorabilia. Historical Book Group. Thursday, Oct. 28 at 5:30 p.m. at the Cynthiana-Harrison County Public Library. The book for discussion will be I’ve Got a Home in Glory Land by Karolyn Smardz Frost. This group is open to anyone interested in history. 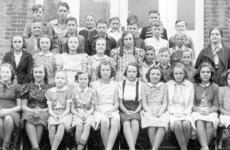 The Center Hill School reunion will be held Oct. 16 at 11 a.m. at the Bingo Hall in Bourbon Square. Anyone who attended or worked at Center Hill is invited. A potluck begins at noon. There will be door prizes, a silent auction and raffles. Our current weather conditions demand that we rethink some of our fall chores. Fall lawn and tree fertilization should come later this year than normal because of the drought conditions. An application of high nitrogen now would only burn up what little green grass you may have and force trees to work more than they should under stressful conditions. Even if you irrigate the lawn and water is not an issue, you still want to hold off because our lawns also share space with the roots of our trees and shrubs and will have access to the applied nitrogen. 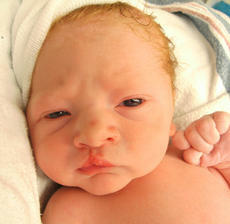 • Ryan Joseph Morgan was born to Joey and Michelle Morgan at Central Baptist Hospital on Aug. 11, 2010. He weighed 7 lbs. 14 oz. 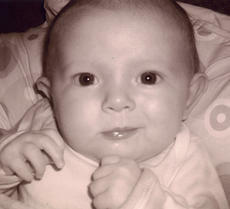 • Anna Grace Fleming was born to Steven and Brandi Fleming of Cynthiana on Sept. 1, 2010 at Central Baptist Hospital. She weighed 8 lbs. 3 oz. Some plants are prolific; some are not. Dandelion seeds float through the air and disperses far and wide in spring or summer; hundreds of tiny seeds burst from the spent blooms of cleome as a sphinx moth feeds at dusk; and you can just walk past some hairy cress and millions of seed burst forth from the draft. Woody plants seem to be a bit more elusive. I have never seen a Serbian spruce spring forth from a fallen cone or an apple tree emerge from rotten fruit beneath the canopy. Starting woody plants from seed can be a bit more tricky. The Harrison County Farm Field Day will be held Monday, Oct. 18 at 4 p.m. We will be visiting the farm of Troy and Mary Ware Bradford located on Connersville Pike. The farm is approximately three miles from Cynthiana. The farm operation includes 300 acres of land which corn, soybeans, tobacco and hay production creates a unique farm program. Although many of these enterprises are labor intensive, I think you will see how you can reduce some of the expenses. •Ryleigh Analeise Maybrier was born to Stephanie Stokes and Justin Maybrier of Cynthiana on Sept. 9, 2010 at Central Baptist Hospital. She weighed 7 lbs. 6 oz. Births announced this week are: Tyler Scott Bowman, Oct. 2, son of Cathy and Junior Bowman; Anthony Cleveland Schultz, Sept. 14, son of Mark and Kristin Walker Schultz; Alyssa Danielle Kilpela, Sept. 7, daughter of Matthew D. and Jeannie M. Kilpela. Harrison County High School Singers head for Disney World, Orlando, Fla., to participate in concert. HCHS choir director is Michelle Hassall. Healthright Family Fitness Club for men and women, Bridge Street Plaza, now open.